I like to take things apart. Sometimes they work when I'm done. 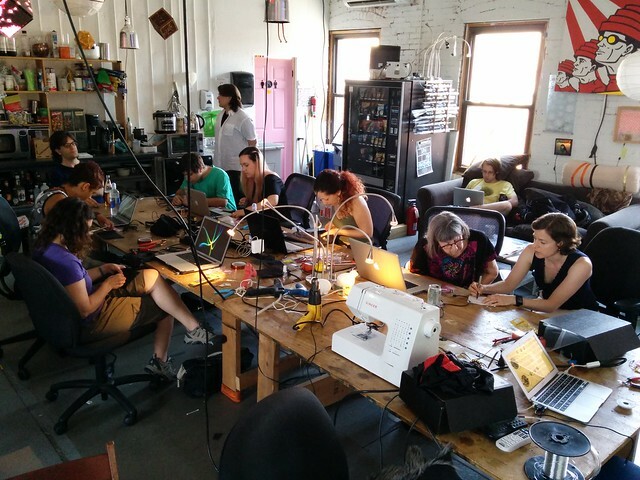 I've been a member of NYC Resistor since 2010 and you can see more of my projects at trmm.net. 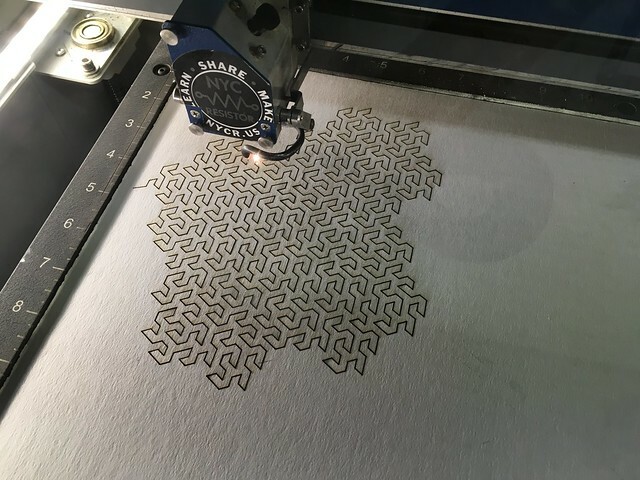 THe Gosper Curve is a self-similar fractal that can be turned into a visually interesting, yet very difficult puzzle on the laser cutter. With all of the pieces the same color it is nearly impossible, but a bi-color version is a doable challenge. You can move the slices (in blue in the SVG file) around to vary the puzzle or change the difficulty; the current version has lots of very similar pieces to make it full of “garden paths” that require frequent back-tracking when the solution almost works. More details are posted on trmm.net/Fractal_Puzzle and the design files are thing:2204078 on thingiverse. 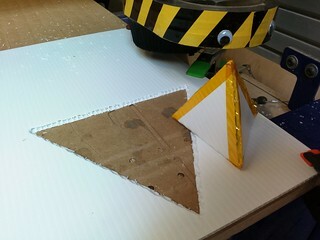 NYC Resistor installed a Shopbot last year and we’ve experimented with different materials. 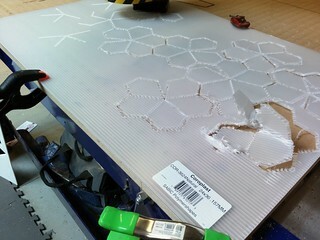 Today I spent some time testing how well the bot would cut Coroplast. 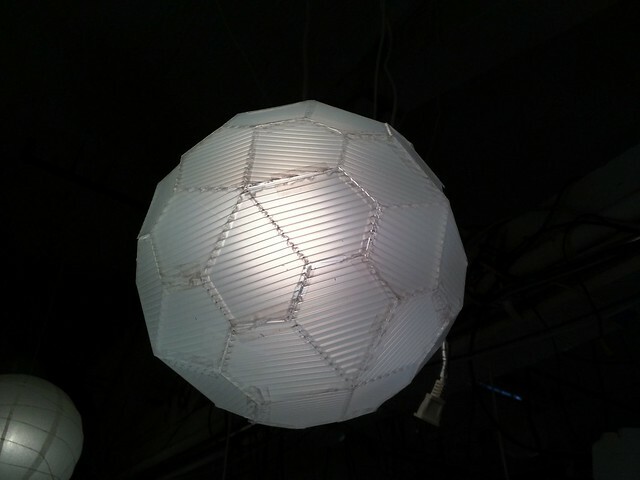 This corrugated plastic is very lightweight, fairly inexpensive, and reasonably rigid when triangulated. There are some problems with cutting it with a rotary tool like the Shopbot, so I wrote some notes on tooling, speeds, feeds and clamping. There is likely a better way to bevel the edges than the 90 degree bit, so I’m still searching. Originally the servo was going to lift the pen, but I ran out of time to integrate the servo with the tinyg system, so it just drags the pen between elements. 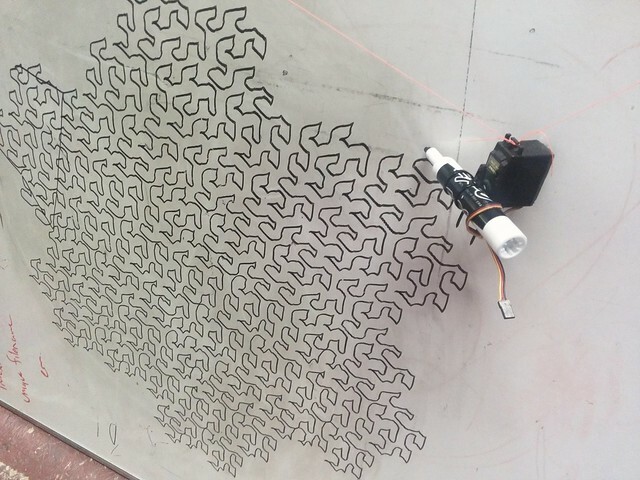 The pen’s angle isn’t controlled, so sometimes it “gouges” the whiteboard and skips around. Hackish source code to generate the gcode and more details are at trmm.net/Polargraph. 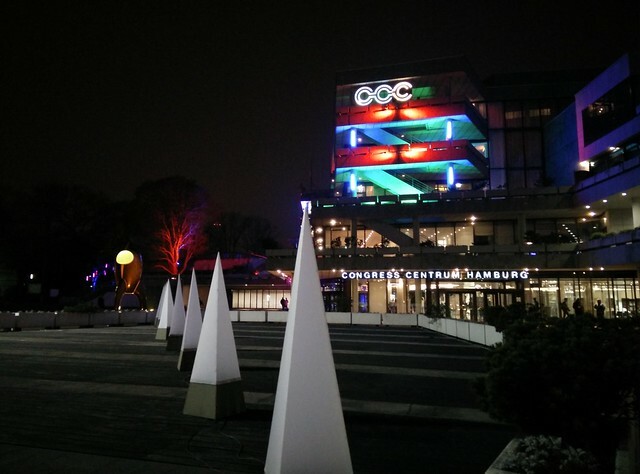 NYC Resistor’s origin goes back to some of its founders attending the Chaos Computing Congress in 2008 and this year we again have a great showing at CCC in Hamburg, Germany. 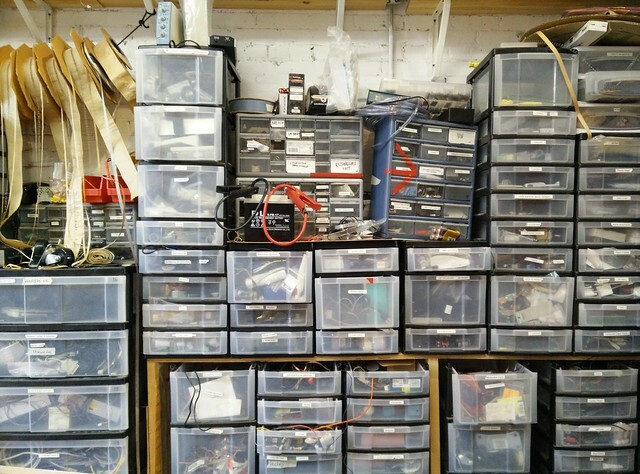 Many Resistors members will be attending and we’ll add to the giant pile of hackerspace stickers. 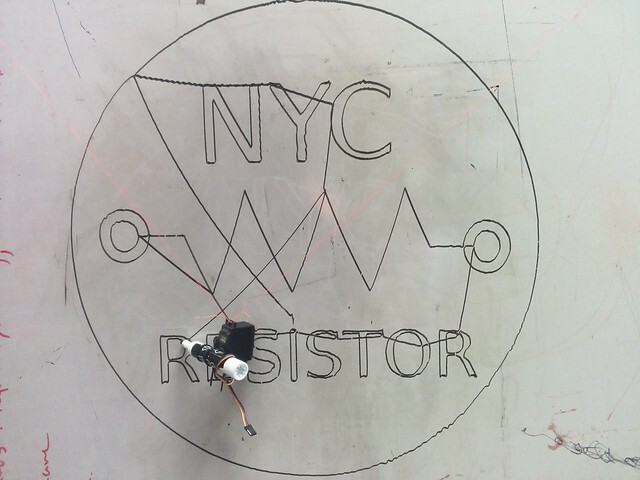 Several NYC Resistor members will be giving presentations at 32c3: Caroline Sinder’s “When Algorithms Fail in Our Personal Lives” (2015-12-30 at 14:00), Matthew Borgatti’s “My Robot Will Crush You With Its Soft Delicate Hands!” (2015-12-27 at 23:00), Trammell Hudson’s “Thunderstrike 2: more Mac EFI firmware vulnerabilities” (2015-12-27 at 20:30) and a joint presentation by Adelle Lin and Trammell Hudson on “Vector Retrogaming with MAME and XY monitors” (2015-12-28 at 18:15). The Congress provides free live streams of all of the presentations, so even if you can’t attend the event you can still watch and ask questions on their IRC channel. There are four days of four presentation tracks with around one hundred talks on a wide range of technology, security, society and art topics. It is well worth looking through the list of events! 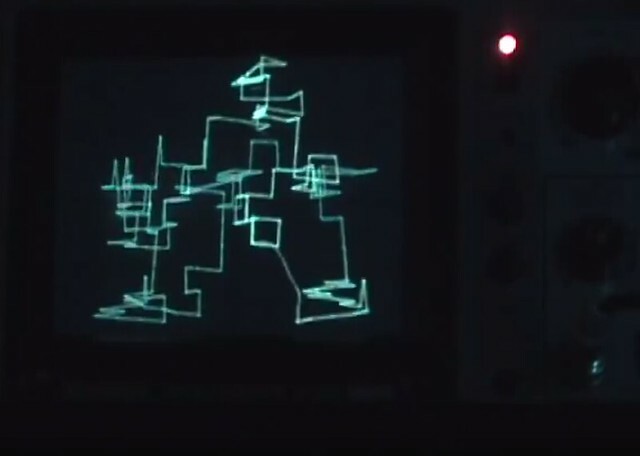 Are you interested in making vector display art or playing retro arcade games on XY monitors? 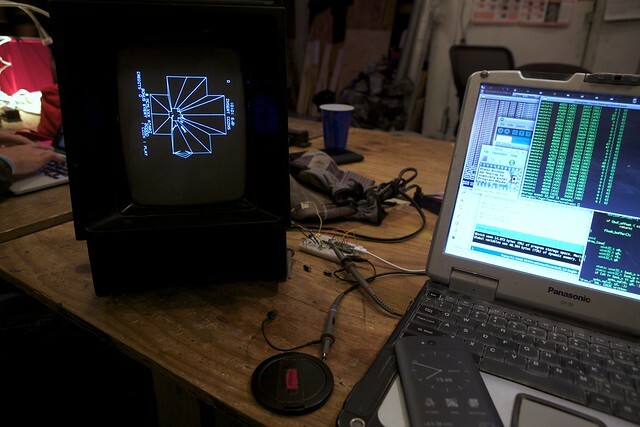 Then you will be excited to hear that NYC Resistor is having a class on interfacing with oscilloscopes, vector monitors and laser projectors. After soldering together the v.st 1 MHz DAC boards, we’ll explore how to write your own vector games or art pieces. We’ll also show how to patch MAME to output the vectors to the USB port and how to convert the classic Vectrex game console to an XY monitor. Asteroids, Lunar Lander and Tempest look great on a real CRT vector display with real phosphors. We’re also organizing a vector demo scene exhibition in NYC in January. This is your chance to display your glowing line art or video game and show off your retro-aesthetic skills. More details on this will be posted later. Buy your class tickets (includes the v.st DAC board) and bring your laptop with your creative straight-line ideas to the space on 21 November! NYC Resistor now has a Gopher site at gopher://gopher.nycresistor.com, although your web browser must be sufficiently standards compliant and/or hip to use it. One such browser is Lynx, shown here running on a Kaypro 2. 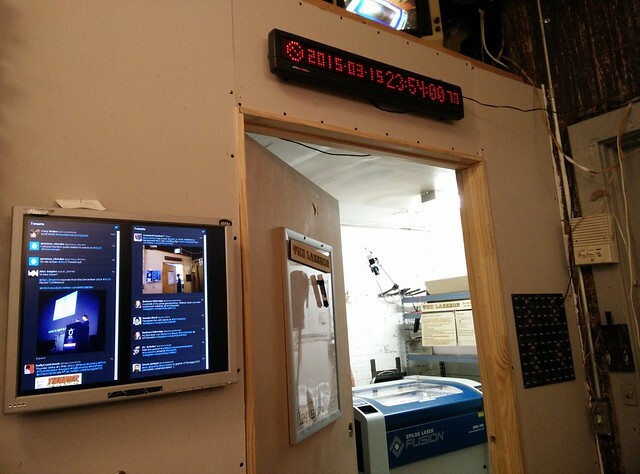 Next time you visit NYC Resistor, you might notice a new LED clock above the laser room door. 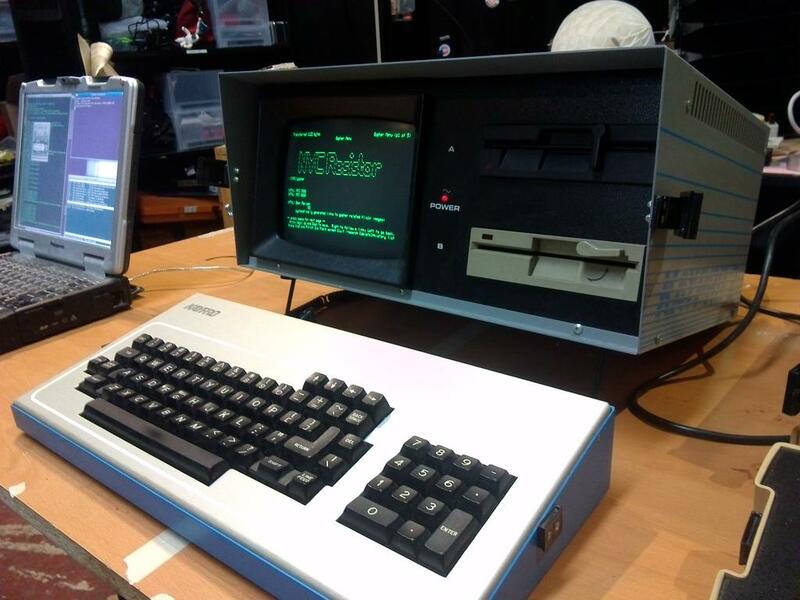 It’s built with a surplus AMD1026 one-line LED display that has been re-brained with a SparkCore. Eventually we might take advantage of it being online to interface with the laser reservation system. 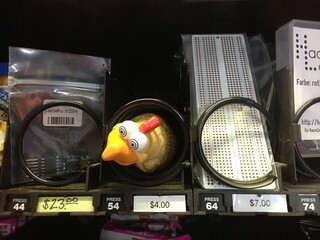 For more details on interfacing with the hardware and the source code, check out trmm.net/SparkSign. 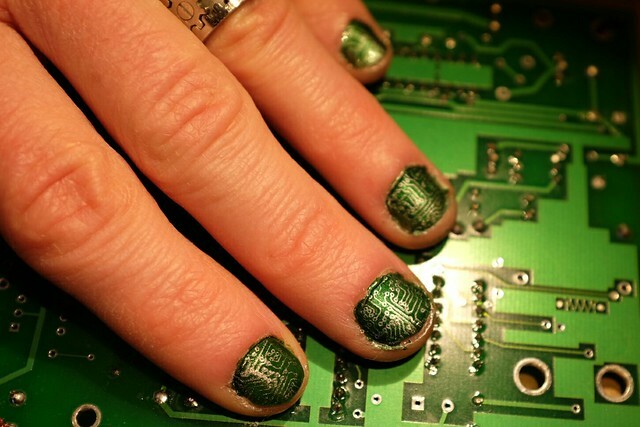 NYC Resistor members Colleen AF and Shelby recently led a workshop on nail art during the first of their 2015 Make-Along Craft class series. 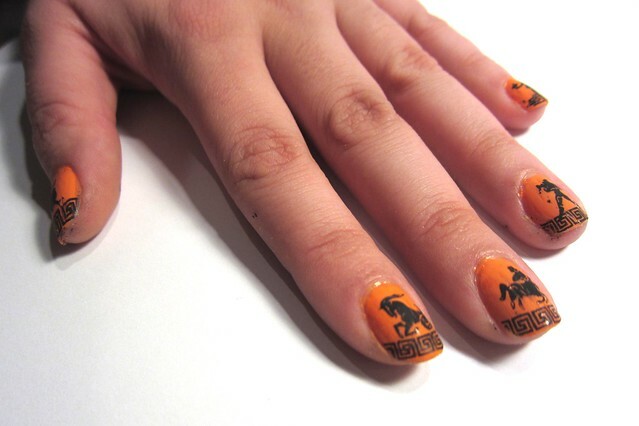 Many of the participants opted for laser cut stencils to jazz up their nails — it is totally safe and doesn’t involve putting your hand in the laser. I wrote a quick Nail Art HOWTO if you’re curious how the process works. It is very surprising how much fine detail you can transfer with the right nail polish and some practice with the technique. Those traces would work for 0603 SMD parts without too much difficulty if we could find the right conductive paint and power supply. Sometimes I want to fabricate things that are larger than the build volume on my 3D printer or to make things that are hollow and can be covered with fabric to diffuse LEDs inside. To help out with that, I’ve written a program that will generate 3D printable versions of just the vertices — the resulting object looks like a real-world wireframe of the STL file. 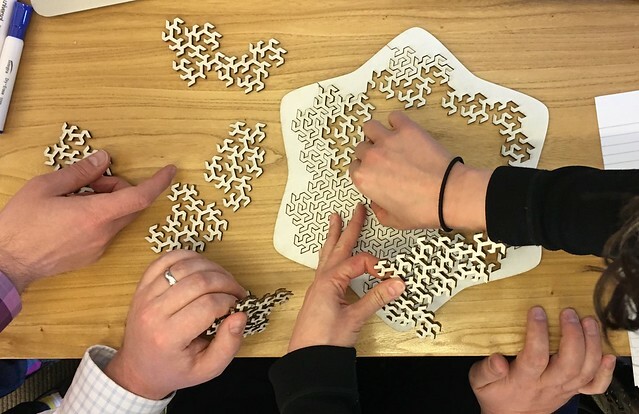 This also lets you use other materials for the edges, like wooden dowels, laser-cut acrylic or aluminum extrusion, and makes it easy to cover with stretchy fabric. 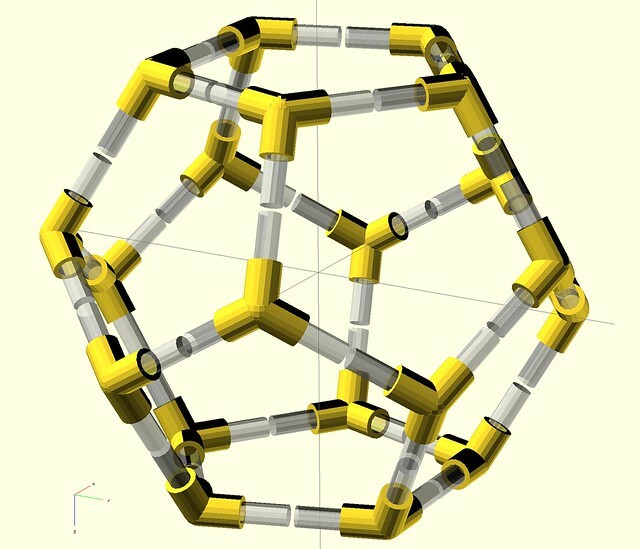 The wireframe program parses the STL file, finds all of the unique vertices, eliminates coplanar edges and generates connectors for the ones that remain. 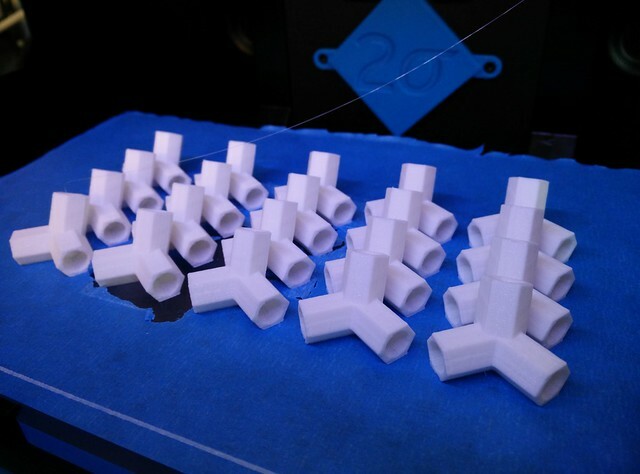 It isn’t very smart about some of the intersections of very acute angles, and the output OpenSCAD file needs some cleaning up before it is ready for printing, but simple low-poly shapes can be fabricated without too much effort. More info is at trmm.net/Wireframe and the source is available. 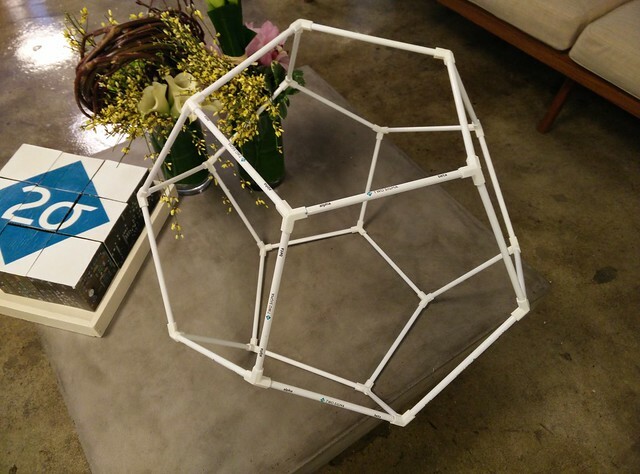 I’ve also posted the dodecahedron that you can make with regular unsharpened pencils from the office supply closet: thing:653464 on thingiverse. I hope you have fun making large-scale things!